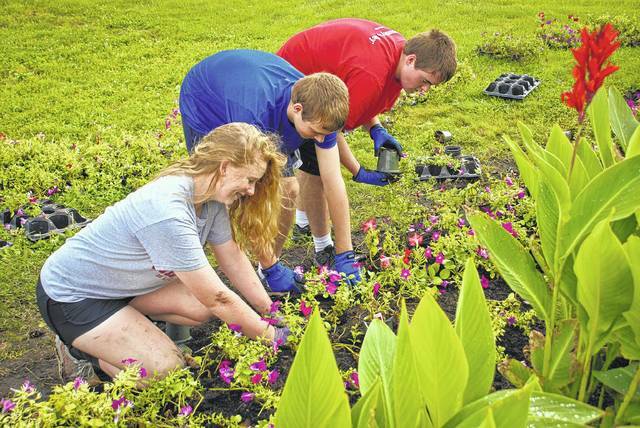 Members of several Delaware County 4-H clubs worked together Monday morning planting flowers left from the Delaware County Ohio Master Gardener Association annual plant sale held Saturday and Sunday. The flowers were placed in the planters in front of the coliseum, around the fair office and around the yard of the fair’s stage. From left to right, Audrey Graham, Joshua Herron and Todd Herron work together along the perimeter of the stage filling in the spaces giving the beds a fuller look. This entry was tagged 4-H, delaware county fair, Gardener’s Association. Bookmark the permalink.